A nutrition educator in San Diego is raising awareness and funds by teaching her students about the devastating effects of malnutrition. 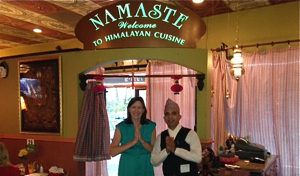 As part of her “Introduction to Nutrition,” class, Katie Ferraro hosted her fourth fundraiser at a local Nepalese restaurant. All proceeds — nearly $3,000 so far — support our Nutritional Rehabilitation Homes. Katie first visited Nepal as a Peace Corp volunteer in 2001 and fell in love with both the country and the people. She returned to the University of California, Berkeley as a graduate student and became involved with the local Nepalese community. That’s how she learned about NYF’s Nutritional Rehabilitation Homes, where severely malnourished children are nursed back to health while their caregivers learn to prepare nutritious meals using locally available food. She teaches a class in “cultural foods” at three San Diego-area colleges: San Diego State University; University of California, San Diego; and San Diego Miramar College. Her course examines the problem of malnutrition and how to solve it. For extra credit, students attend a fundraising dinner at Himalayan Cuisine restaurant in La Mesa where the owner, Khem Kharel, talks about Nepali culture and diet. Then they eat dinner of rice, lentils (dal bhat), curried vegetables, yogurt sauce and chicken. Thank you, Katie, for caring about the children of Nepal! Learn more about our Nutritional Rehabilitation Homes.